1. Place pork and marinade in large zip-top plastic bag. Seal bag, pressing out excess air; gently massage to coat pork. Refrigerate 2 to 6 hours to marinate. 2. Meanwhile, cut crown and stem end off pineapple. Stand pineapple upright and slice off rind and eyes. Cut 1/2 of the pineapple crosswise into 1-inch-thick slices, then cut around core to remove (reserve remaining 1/2 pineapple for another use). Brush both sides of pineapple slices with 1 tablespoon oil. 3. Prepare outdoor grill for direct grilling over medium heat. In cup, combine salt, black pepper, thyme, cayenne and cumin. In medium bowl, toss potatoes, onion, 1-1/2 teaspoons spice mixture and remaining 2 tablespoons oil. Cut 1 long sheet (about 30 inches) aluminum foil. Arrange potato mixture in single layer on half of foil sheet. Fold other half of foil over to cover potatoes; fold edges several times to seal tightly. 4. Stir garlic, allspice and cinnamon into remaining spice mixture in cup. Remove pork from marinade; discard marinade. Rub pork with spice mixture. Place pork and potato packet on hot grill rack. Cover grill and cook pork 18 to 20 minutes or until internal temperature reaches 145°, turning pork occasionally; cook potato packet 20 minutes, turning once halfway through cooking. Transfer pork to cutting board; let stand 10 minutes. Remove potato packet and let stand. 5. Meanwhile, place pineapple on hot grill rack; cook, uncovered, 10 minutes, turning once halfway through cooking. 6. With scissors, carefully cut open 1 end of potato packet and allow steam to escape. 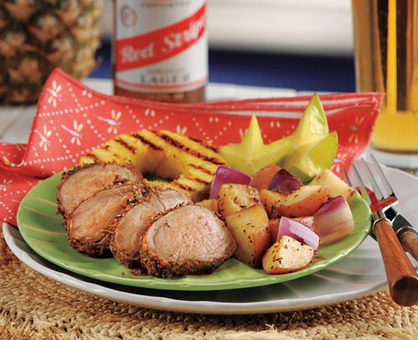 Thinly slice pork and serve with potatoes and pineapple.